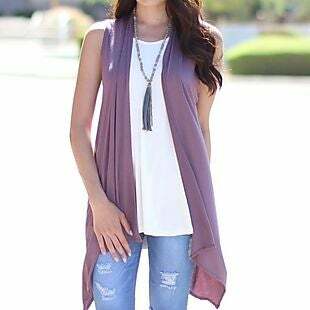 This Sleeveless Cardigan drops from $26.99 to $12.99 at Jane. Even with $4.99 in shipping fees, this is the lowest price we could find based on a similar cardigan. Choose from 17 colors in sizes S-XL, but not all size/color combinations are available. Shipping adds $4.99 for the first item and $1.99 for each additional item. Sales tax is charged in most states.